Blend lemonade-flavor drink mix & yellow cake mix for a simple Lemonade Cake! 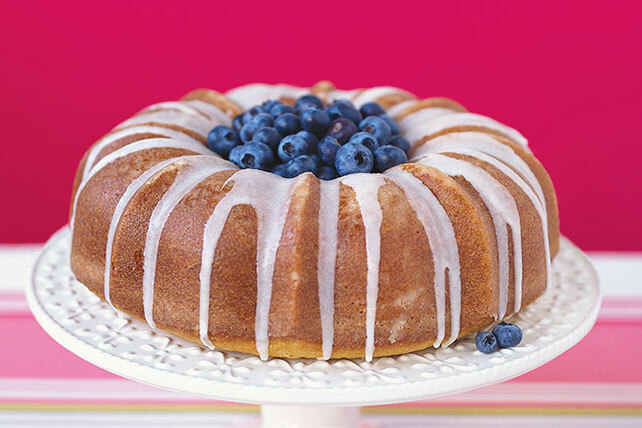 This Lemonade Cake is a treat for any backyard party or summer get-together. Reserve 2 tsp. drink mix for glaze; set aside. Place remaining drink mix in large bowl. Add 1/2 cup water; stir until mix is dissolved. Add dry cake mix, sour cream, eggs, oil and half the lemon zest; beat with mixer until blended. Pour into greased and floured 12-cup fluted tube pan or 10-inch tube pan. Bake 42 to 45 min. or until toothpick inserted near center comes out clean. Cool cake in pan 10 min. Loosen cake from sides of pan with knife. Invert cake onto wire rack; gently remove pan. Cool cake completely. Transfer cake to plate. Whisk remaining drink mix and water in medium bowl. Gradually stir in sugar until blended; drizzle over cake. Sprinkle with remaining zest. Spoon blueberries into center of cake. Prepare using a lemon cake mix.